It’s one of my favorite athletic events. There are runners of every stripe and speed, kids, runners in costumes, walkers, and so many people cheering the runners on. Such a great atmosphere. This year I registered early but once again ended up with knee issues that meant I couldn’t really train for the event. Other than my holiday running streak there hasn’t been much running for me this year. Instead I was going to regular knee physio. Thankfully Sarah ran with me and helped keep me running at a reasonable pace. We set out to run 5 and walk 1 but a couple of times we ran extra minutes to make it uphills or to the water station. I was so slow–my slowest, happiest 5 km ever– but I was running. I was smiling. And in the end nothing hurt. What a happy day! Sarah: Like Sam, I haven’t run much this year. I kept putting off registering for the Pride and Remembrance Run, telling myself I would once I’d been out for a jog or two. Of course, life happened in its usual way, and I hardly ran at all. I wasn’t until last week that I made a snap decision to register. What convinced me? After all, it’s a wide open course held on city streets so it’s not like I couldn’t have snuck in and run with Sam without having a bib number. I was happy, though, to hand over the la$t-minute registration fee knowing it would be going to support several great causes. Over the past 21 years, the Pride and Remembrance Association has raised over $1.3 million for local charities that support the lesbian, gay, bisexual and transgender (LGBTQ+) community. This year’s beneficiaries include the Transitional Housing Program at Fife House, the Day Health and Wellness Program at Casey House; both are outstanding resources for people living with HIV/AIDS. Funds also went to support the Canadian Centre for Gender and Sexual Diversity’s Gay-Straight Alliance Forums.I also got to enjoy the fabulous costumes of the other participants, a beautiful slow run under perfect conditions, and a free brownie at the end. What’s not to love? Susan: I had intended this to be my fastest recorded 5k ever. It was not. Not at all, not even a little bit. My first mistake was going too fast in the first kilometer. A good clip for me is 6:30 per km. I was going at about 5:40. My next mistake was getting in behind the Premier of Ontario, Kathleen Wynne. Say what you want about hydro rates, that woman can run. She is closer to my mom’s age than mine so I thought, “I’ll just try to keep up with her and that will be a good pace”. Wrong. I realized that my heart rate was dangerously high and I was feeling very bad around the 3km mark. I slowed down but it was too late, I was toast. I walked for about a km then picked up running near the end. My average pace was 7:10 when all was said and done. Usually that would indicate a leisurely run. In this case it indicated feeling like death was imminent followed by emergency walking and being grumpy. But hey! It was Pride and it was fun so that’s something. 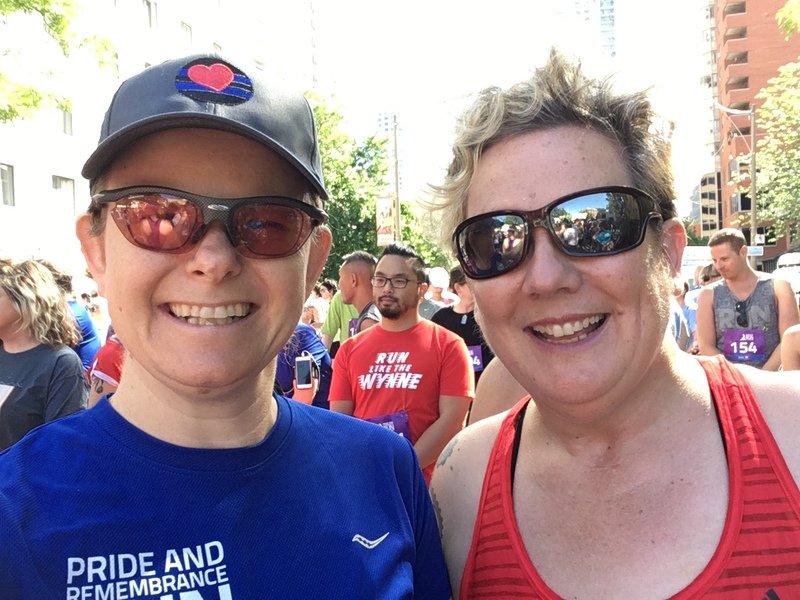 The Toronto Pride and Remembrance Run is one that I do every year, regardless of what my other training goals are. It’s a bit of a tradition with several of my former classmates from the Astronomy Department at U of T – we’ve been running in the race for six years now. I haven’t been training hard since the 50k in May, but I have been running 2-3 times a week. I definitely haven’t been running “fast” for the better part of a year. So my goal was to run hard, but still have fun, and see what I could do. I set off and my pace of about 5:15 per km felt pretty sustainable. I was happy with that. I used to be able to race a 5k in or a bit under 25 minutes, but that was when I was specifically training for speed. There were times when I wanted to stop (mostly the slight uphill parts in the sun), but each time, I thought “this isn’t nearly as far as you ran in May.” Knowing the discomfort wouldn’t last long worked to keep me going and I finished in 26:37. As an added bonus, the super supportive and very fun Run to Beer crew was handing out cans from Great Lakes Brewery to teammates just before crossing the finish line. In all it was a good run with great friends in a happy and positive environment. Love it! Next year? It’s a great course and a great crowd. I know 5 kms aren’t your thing but it would be fun to do with a big group of FIFI bloggers. Sarah got a brownie?! Where were the brownies and why didn’t I get one?! There were warm delicious brownies in the park. That’s where the medals are handed out and post race announcements and speeches are. Also bagels, bananas, and drinks. A lot of food for 5 km. It’s a great event. Do it!